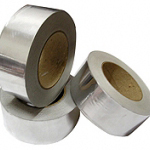 Aluminium Foil Tape is adhesive one side and reflective aluminium foil the other. Excellent Heat Resistant qualities. Ideal for jointing foil faced glass fibre or rock-wool insulation panels, sealing off air conditioning also ideal for quick repairs to gutters, down-pipes, ducting and many other surfaces. UV resistant and Waterproof. If you manage to find a lower price call us on 01268 768 768! © 2019 Alligata, all rights reserved worldwide.